Serendipity Blackmagic / Megarip includes manufacturer ‘Printer’s Screening’ or ‘HTM’ (half tone module) drivers for many printer models. Printer screening drivers utilise manufacturer designed LUTs (look up tables) to control the printer’s output. In addition, these LUTs utilise the extra inks available to certain printers – such as red, green, orange, violet and blue – to print using an expanded, virtual RGB ink set. Printing in an RGB device colour space generally provides a significantly larger gamut suited to photographic and wide-gamut contone proofing output. The sample configuration described below is for a Canon PRO-2000 printer being calibrated to match an sRGB colour space. If any terms or functions mentioned are unfamiliar please refer to a Serendipity Blackmagic / Megarip version 7.0+ User Manual. Note: The specifics of RGB Output ICC profile creation are not covered in this article. Consult the documentation for your ICC profiling software. Watch the Youtube video, or follow the instructions below. Below is a guide to configuring and calibrating RGB printer output using Serendipity Blackmagic / Megarip version 7.0 and above. Create and assign the Output ICC profile. Note: Before beginning, make sure the printer is running optimally. Check to make sure the heads are clean and printing correctly. Open the Workbench application via Application menu > Workbench. Select the Canon imagePROGRAF PRO-2000 / PRO-4000 / PRO-6000…(Printer’s Screening) Output Driver. Enable (tick) Monitor Printer Status. Select the Destination Driver (connection method). Connection via Bonjour/Zeroconf or TCP/IP Port is recommended. Configure the connection address as required. In the Queue Control panel, set the Status to Active. assign an RGB ICC profile to ICC Profiles > Output > Profile. The default sRGB is fine, although any RGB profile can be used at this stage. set the Manage > RGB Input > Profile to sRGB. Note we are using an sRGB ICC profile for this example. If the profile you wish to use, e.g. AdobeRGB1998, is not currently in the database, click the Upload Profile button in the ICC chooser pop-up, then navigate to the profile. Set the RGB Input > Rendering Intent to Relative. Ensure the Always Use ICC option is ticked on. Assign the Output, Media and Jobticket created previously (above) in the Output panel. Printer drivers that use the printer’s own internal screening, like the one in this example, don’t require a Paper Profile to be configured and assigned to the Media. The printer itself takes over the dot selection, ink limiting, separation and screening functions. The next step in calibration is linearisation. Linearisation brings the printer into a known, neutral state, and gray balances the printer output. When the a linearisation chart is printed all other colour management is disabled. This allows the printer to be re-linearisation in future without having to disable ICC, correction curves, etc. It is recommended that the linearisation should be updated (reprinted and measured), on a regular basis. This returns the printer to the same state it was when your ICC output profile was created and assigned. Launch the Lineariser application via the Application menu. Select your Media from the Available Media list. Select the instrument to be used to measure the chart (in this example an X-Rite i1iSis) from the Spectrophotometer drop-down menu. Click the Print Chart button. Before printing, a popup will appear asking if you want to “Apply Colour Corrections to the Linearisation Chart”. Choose the default “Don’t Apply. Print to Linearise” option. Pick the Pagesetup and Jobticket created previously. Once printed, allow the chart to dry and stabilise for 5-10 minutes. Note – the Lineariser interface displays three (3) ink channels, Red, Green and Blue. 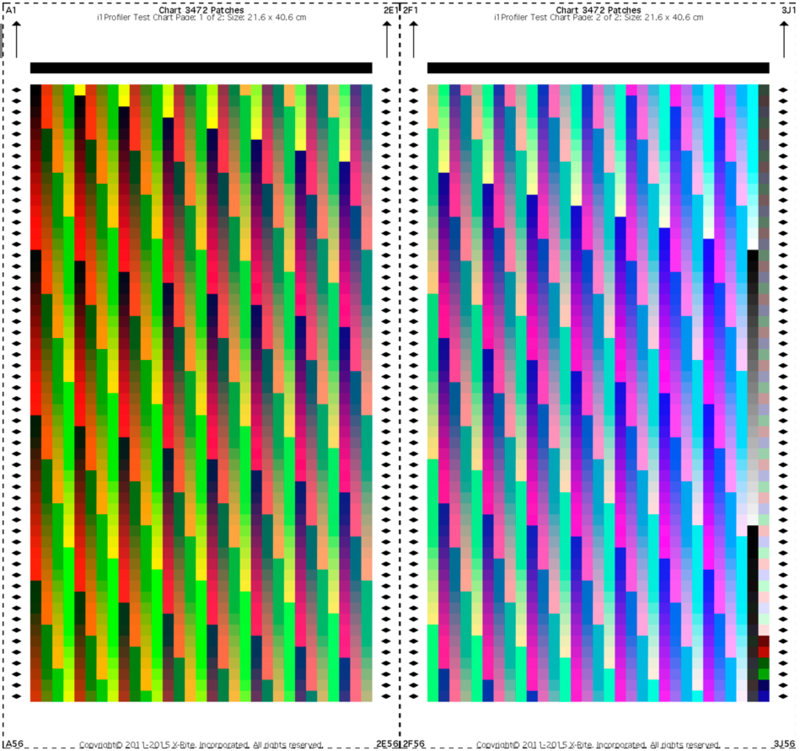 However, the RGB linearisation chart will printed and measured as a single black/gray strip. Check the instrument selection in the Spectrophotometer drop-down menu. Follow the calibration instructions and begin measuring. Depending on the device used, the patch or strip to be measured will be highlighted. If measurement is not automated for your spectrophotometer, measure each patch or strip in turn following the instructions at the bottom of the Lineariser window. To re-measure a strip simply select and measure it again. When all measurements are complete, Save the chart. If the Media does not already have a curve applied to it (as in this case), a save window will appear to enter a name for the curve. Enter a curve name and then click OK to save. When the Linearisation (Gradation) curve is saved, it is automatically assigned to the Media. If linearisation curve data already exists for the Media, Cancel / Create New / Overwrite options are made available. 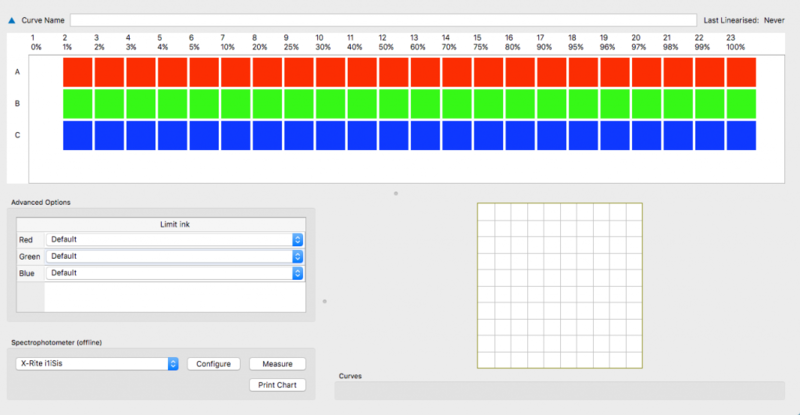 Using your ICC profiling software, generate and save an RGB ICC target chart. The target chart file must be saved in either TIFF or EPS format. For best results, it is recommend the RGB target chart contain at least 1400-1600 patches. Sample 2 page, 3472 patch RGB ICC target for the X-Rite i1iSis. In the Serendipity Client, select Submit menu > ICC Target. Submitting using this option ensures all ICC correction is disabled for printing. Use the file chooser to navigate to and select the ICC target chart file. Click Open. Select the Pagesetup, Media and Jobticket created previously. Click Submit to print the target. Once printed, allow the ICC target chart(s) to dry and stabilise for a minimum of 20-30 minutes. 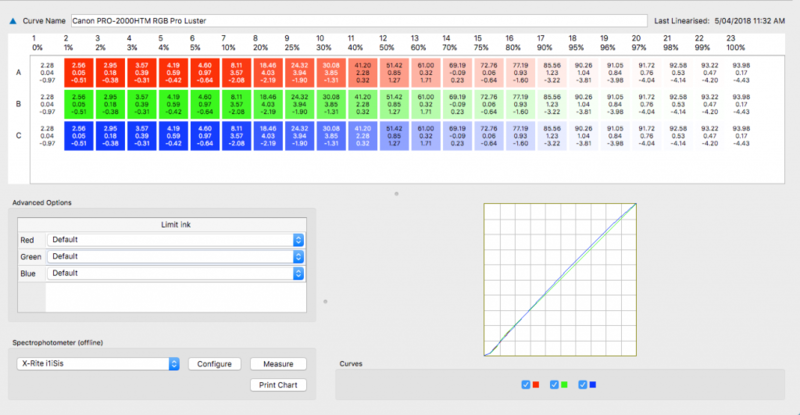 When the chart is stable, measure it using your ICC profiling software, then create the RGB output ICC profile. Select the Media created previously. Click the Profiles button under ICC Profiles > Output. Click on the Upload File button in the Choose an RGB output ICC profile pop-up chooser window. Navigate to and select the saved RGB output ICC profile, then click Open. In the second window, choose the printers folder and click OK. The profile will then assigned to the Media. The Blackmagic / Megarip Media is now calibrated and ready for printing. If an RGB Media has been calibrated using suitable proofing paper it can be used for contone proofing. providing a wider available gamut for spot/special colours. The larger RGB gamut of the output ICC profile will in many cases encompass an entire ISO press standard gamut, such as Fogra 39 or GRACoL, while providing a wider available gamut for spot/special colours. Assign a CMYK Press Input match profile to the Jobticket, then print and measure an appropriate Calcheck chart using the Calcheck application to see if the Media passes your required press standard. This entry was posted in Blackmagic, HowTo, Megarip, Printing and tagged Version 7.0+. Bookmark the permalink.